Over the past few years I’ve begun to notice more and more Dylan infiltrating my musical world. Unlike many music geeks, I’ve never had a “Dylan phase”. Nonetheless, I’ve always appreciated and respected him as a great artist. His music may not have grabbed hold of me, but it grabbed hold of a lot of people whose taste I respected. And although for many years I owned no Dylan records, it wasn’t for quite the same reason that I owned nothing by Rod Stewart or Elton John. Unsurprisingly then, as the years wore on, I found myself acquiring the occasional Bob Dylan album, while my collection remained mercifully free of Stewart and John. So despite never having that Dylan phase, I’ve finally got to the point where I’d call myself a fan. In fact, there’s a recording of Tangled Up In Blue on The Bootleg Series that’s become one of my favourite songs by any artist. In a certain mood, it can send a shiver down my spine and make the hair on the back of my neck stand up. When music has such a deep and direct emotional… even biological… impact, then you know you’re listening to something special. I was intrigued then, when I started to hear about I’m Not There, the recent and highly acclaimed cinematic biography of Dylan. But the more I heard, the more sceptical I became. As a fan of Dylan’s music who knows almost nothing whatsoever about the man (or even, strangely enough, the myth of the man), I was actually quite interested in the idea of learning a bit about his life and the events that shaped his music. As quickly became clear however, I’m Not There was unlikely to be the film to satisfy that desire. He started out as a traditional folk singer covering the songs of Woody Guthrie (a depression-era folk singer about whom I know even less than a single paragraph). He then started to write his own lyrics and became a folk music legend. He introduced The Beatles to pot in the early sixties and hung out with them occasionally in London (I did have a “Beatles phase”) where he also spent some time with Allen Ginsberg. He picked up an electric guitar and got called “Judas” by the folk scene. Nonetheless he became increasingly successful, but like most people who become living legends was fairly troubled by the experience. He turned to religion, and got into Jesus in a very big way for a while. Latterly he has settled down to tour and make a bunch of albums that inevitably could never have the impact of the earlier ones that created the legend in the first place. To be honest, I’d hesitate to add anything to that paragraph despite having watched a two and a quarter hour film about the man’s life. And I think that’s kind of weird. But of course, it can be argued (and I have no doubt that Todd Haynes, the writer and director of I’m Not There, would do so) that the film fundamentally isn’t a traditional biography. It is quite clearly not attempting to tell the Bob Dylan story in a traditional, linear, literal sense and so it’s unfair to criticise it for failing to do so. And here’s the thing; I accept that. I understand what Haynes was trying to do, and he has to a great extent succeeded. We’re deep into the review and this is the first time I’m saying this, but let it be said; I’m Not There is a masterpiece. It is one of the most beautiful, compelling and perfectly constructed films I’ve seen in a long time. It’s got a magical, hyperreal quality to it that reminded me a lot of David Byrne’s underrated True Stories in places and Woody Allen’s underrated Stardust Memories in others. It is a magnificent piece of cinema and I’d urge all of my readers to check it out, whether or not they are fans of Bob Dylan. It’s a masterpiece. But it’s a flawed masterpiece. Because when I’m watching a truly great film, the last thing I want is to be dragged out of that immersion in another world towards the nagging questions of my own mind. And I just couldn’t prevent myself from wondering which events were close to being direct representations of scenes from Dylan’s life and which were metaphors. The film tells the story metaphorically, but clearly strays further from literal reality in some places than in others, and the part of me that was hoping to learn something new about Bob Dylan insisted on wondering which was which. Don’t get me wrong; I’m well aware that’s not the right way to view such a poetic and dreamlike film; but I’d argue that for fans of Dylan’s music who know nothing about his life, it’s damn near unavoidable. Did he really say that in a Press Conference? Or are they the Dylanesque words of a screenwriter? Did he ever spend time travelling America in box-cars? Clearly he didn’t do it as an eleven year-old black kid, but are those scenes entirely a metaphor for his early fixation with Guthrie, or are they also illustrative of a real period in Dylan’s evolution? And while Haynes might argue that the point is that the young Dylan’s heart and mind were living a hobo’s life… that it doesn’t matter precisely how literal or metaphorical the scenes are… in reality that’s simply not quite true. A young man travelling from town to town, earning his meals playing folk music, is having a fundamentally different set of experiences to a young man who — feeling trapped and suffocated by suburbia — escapes to the open road in dream and fantasy. As well as the dreamlike / metaphorical style of the film, I’m Not There is also known for the creative casting. The different stages of Dylan’s life are portrayed by different actors. So Marcus Carl Franklin is an 11-year-old hobo called Woody Guthrie. Christian Bale is “Jack Rollins”, a legendary folk singer who retires from the public eye to become an evangelical preacher. Heath Ledger is a famous actor who plays Jack Rollins in a biopic and whose personal and family life is torn to shreds by fame and public adulation. Richard Gere is “Billy The Kid”; the older Dylan, a fugitive from his own legend. Ben Whishaw is “Arthur Rimbaud” who declaims to camera in scenes which may have had a significance I didn’t grasp (did Dylan really face persecution as a leftist in his early days? Or is that a metaphor for how he felt he was being viewed and treated by mainstream America?) And last but far from least, Cate Blanchett plays “Jude Quinn”, the legendary folk singer who picks up an electric guitar. Paradoxically, Blanchett manages to be the second great flaw in I’m Not There despite turning in the best performance (one worthy of all the acclaim it has received). She is utterly hypnotic when she’s on the screen and overshadows five other fantastic actors. But if anything, she is too good. Partly the quality of the make-up, but mostly the quality of her acting, meant that I found myself — again and again — involuntarily thinking “I really can’t believe that’s Cate Blanchett! She’s just incredible!” And of course, few things are as likely to burst that bubble of cinematic immersion, than repeatedly being reminded of the actor in the role. Which is a shame. Superficially, perhaps if she hadn’t looked so much like Dylan, it would have been easier to accept her…? I don’t know. As it was, she was the best actor in the film, but she was also the one who most exposed the film as a film, rather than an unfolding dream. A flawed masterpiece is still a masterpiece. And I’m Not There is the kind of film that only comes around every handful of years. It stands head and shoulders above everything else released last year (though I say that without having seen the new Coen Brothers movie yet) and if you’ve not seen it, then I urge you to. The flaws are certainly there, but despite having spent a disproportionate amount of time talking about them here, they never overshadow the film as a whole. This is a truly great piece of cinema and if you go in expecting “near perfection” as opposed to “absolute perfection”, you won’t be disappointed. 7 responses to "I’m Not There"
If Tangled Up In Blue wets your whistle, then listen to the Bootleg Series version next to the Blood On The Tracks one followed by the version off Real Live. The way he rejigs the lyrics to bring out different accents and throw different lights on the (I’m struggling to find a word that won’t sound so overblown, but this is the nearest I can get) mythology of the song is just superb. Also, have you heard his Theme Time Radio Hour shows? They’re incredible. He picks a theme – eg, this week’s one was the Devil, a couple of weeks back it was colours – and plays songs that reference the theme. His taste is wildly eclectic, lots of great old blues, soul and early rock n roll, but he’ll happily play Beatles and whatever too. He always has some interesting biographical tale about the artists, and will often preamble a track by reciting a verse or two of the lyric. In doing it he pulls such meaning and significance from what could otherwise have passed you by. the spoken bits are every bit as good as the excellent music. They’re on subscription stations in the USA but we get them on BBC Radio 2 and BBC 6Music in the UK (available on the Listen Again slot for a week after boradcast), and I believe Phantom 105.2 broadcast them in Eire. They’re also findable on Soulseek too. Go get em Jim, if you’re not too busy watching the Fantastic Four again. Probably goes without saying that Scorcese’s No Direction Home (1) is brilliant, and from your comments about this film, (2) sounds like a great companion piece. Not seen I’m Not There yet, but surely will soon after reading this! I really thought your insight and organization of your observations on this film was superb. Well done. Since you seem to have ‘sparked’ to the material, I wanted to try and fire you up over my new nevel, BLOOD ON THE TRACKS, which I really think you will enjoy. Suspects? Tons of them. The only problem is they’re all characters in Bob’s songs. You can get a copy on Amazon.com or go “behind the tracks” at http://www.bloodonthetracksnovel.com to learn more about the book. Glad you liked the review Tom. Usually I don’t allow commercial linking, but authors plugging their novels; especially when actually relevant to the topic of the post; are an exception. Gyrus, I’ve just checked my online dvd rental place and they don’t actually stock No Direction Home. I’ll definitely keep an eye out for it though. Merrick, I’ve noticed the differences in the versions of Tangled Up In Blue when I’ve heard them alright, but I’ve not done a back-to-back listen as yet. And I’ll check out those Dylan broadcasts. I hardly turn on the radio these days, but I can always download the shows and listen to them on my mp3 player on the bus. 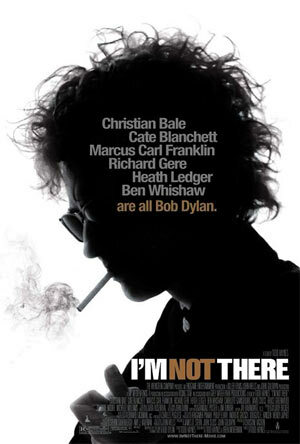 i was debating with merrick just the other day whether or not to check out ‘I’m Not There’. i think on the strength of your review i will. The odd thing about the premise of the film (the character of ‘Bob Dylan’ being played by many people) is that, even though he appears to have no hand in the films making, it is completely in keeping with the ideas in the 2 films Dylan wrote &/or directed himself. In ‘Renaldo & Clara' Dylan & his real-life wife play the couple of the title, while someone else (Ronnie Hawkins, i think) plays ‘Bob Dylan’, & someone we all recognize as Joan Baez plays someone called ‘the Woman in White’. A guy who we will all agree looks just like Allen Ginsberg is in the cast list playing ‘The Father’. No one is who they say they are, but what do we actually ‘know’ about any of these people anyway? It’s a maddeningly infuriating film interspersed with some incredible music but it says a lot about Dylan’s ideas about art & identity. I wish they would finally release it properly so i could check it out in full. You can sit & think about lines like that for a very long time. It doesn’t always make what it’s reaching for, but it’s reaching for things no one else is reaching for, so it comes to have whatever value it has for us because of this. On the book front, Michael Grey’s book ‘Song & Dance Man’ is very good, it gives the work of its subject the treatment it deserves, & Dylan’s own ‘Chronicles’ is a great read – again, a fine companion piece in idea & delivery to ‘I’m Not There’. As far as straight-up biographies go, though, Anthony Scaduto’s book is probably the simplest & most straight-forward, as it was the first. But only goes up to about 1971, which leaves out an awful lot, obviously. But it IS the least clouded by legend & hero-worship. All this is making me want to go & watch ‘Masked & Anonymous’ again, so i’m gong to go & do that now. It’s rather difficult making recommendations for you m’hoop, as you’re well aware. That said, I’m actually fairly confident that you’ll get a lot from I’m Not There. You’ll laugh out loud at the scene where Jude Quinn / Cate Blanchett plays the first electric gig at a Folk and Jazz festival. That, at least, I guarantee. Go see it, and let me know what you thought.